Cricket nets – or cricket practice net facilities – are a key tool in the cricket coach’s armoury; offering a safe and enclosed space to hone the skills of both batsmen and bowlers. Here, we will look at the different types of cricket nets available to clubs, the standards set for cricket nets by the England & Wales Cricket Board (ECB) and essential maintenance for cricket nets. As with anything, the type of cricket nets range from the basic to state of the art, but themain distinctions are between the types of netting system and surface on which the facility is based. The most basic are created using a mobile batting cage – basically a metal framework on wheels that can be moved around the ground – and a standard grass cricket pitch. Probably the lowest cost option, these are still used by clubs on a budget and can also be useful to create additional practice facilities at grounds that have a busy coaching schedules. The main downside is that practice sessions will put greater wear and tear on the main cricket table and also rely on good weather or the use of ground covers to keep the playing surface dry. One way of getting around this is by using a mobile batting cage over an artificial cricket pitch – not only will this relieve the impact on the club’s grass pitches but the surface will be usable most days of the year, even after rain. 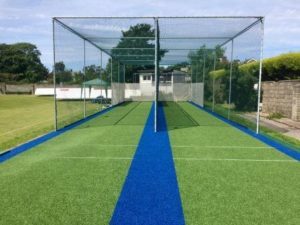 Over the past decade, the use of mobile batting net cages has been on the decline, due mainly to more and more cricket grounds, clubs and schools investing in permanent, purpose-built cricket nets. While cricket nets facilities can be based on grass, the rapid evolution of synthetic cricket pitches in recent years has seen more and more choose to invest in this low-maintenance, hard-wearing option. This investment has been driven by the availability of funding from sources including the ECB and Sport England among others; seeing clubs from grass roots to first class taking advantage of the opportunity to improve their facilities. To access this funding, however, grounds must select a supplier and product that meet a stringent set of performance criteria set out by the ECB in its TS6 ‘Performance Standards for Non-Turf Cricket Pitches’ document, which describes the requirements for non-turf cricket pitch systems intended for outdoor use. When selecting a supplier, clubs should take into account a range of factors – alongside budget – including the pedigree of the installer, the features of the individual cricket net system and warranties, as well as paying important site visits to clubs where the system is already installed and in use. 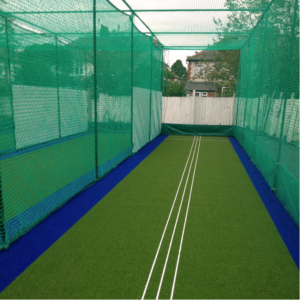 These include the flagship tp365 system which, featuring a premiere wilton woven carpet, exclusively designed ‘HD Protection Tunnel’ netting system and a dynamic base which has been designed to offer a balanced game between bat and ball and encourage turn is the most popular for use in cricket nets facilities. Tp5t, meanwhile, shares tp365’s dynamic base, netting designs and all of the playing characteristics but with a less inexpensive – tufted – carpet. tpB1 is the latest addition to the range; offering a bound (Asphalt) base option. The tpB1 system comes with a premiere wilton woven carpet and the netting system used with the tp365 system, but its bound – or engineered – base design offers greater stability in flood risk areas and, initially, lower maintenance requirements in high-use open sites. The ECB’s TS6 document does not stop with setting standards for newly built facilities, but also for their ongoing maintenance. In cricket practice net facilities, the quality and condition of the ball stop structure – i.e. the cricket nets and framework – is critical. Each artificial cricket practice nets facility incorporates a ball stop structure in the form of a netting system – or cricket nets – held up by a framework, typically tubular poles, to ensure the safety of players both inside and outside of the facility. The design of the ball stop structure should not hamper play, but provide a safe area to play within, and the framework structure must be designed and maintained in accordance with the England & Wales Cricket Board’s (ECB) ‘TS6’ document. Prior to every practice session the cricket nets facility must be carefully inspected – not only the stability of the framework, but the netting itself – examined for damage to avoid prevent flying balls from hitting players in adjacent lanes, people or buildings outside of the facility. Cricket net damage can occur through impact, general usage and third-party damage (vandalism/vermin), and net upkeep is part of the basic maintenance of any system. In traditional cricket practice net systems, where netting is attached to each side of the framework in single sheets suspended from hooks on the frame, it was commonly advised that cricket nets be completely removed from the framework at the end of the playing season. This would allow them to be thoroughly checked, any repairs made and the netting stored away safely before the worst of the winter weather hit. In the case of total-play’s HD Protection Tunnel Netting System, however, this is no longer the case. The nets, which form a seamless ‘cocoon’ around each lane rather than being hung as single panels, are anchored more firmly to the frame with a tension wire system. The unique design ensures the tension wires take the strain of the netting, especially in high winds and snow. The strain is passed through the entire net and not loaded in one place, as with traditional ties and fixings, while the fixing positions of the hooks also load the framework at its strongest points. The result: a netting protection system that spreads the pressures of wind and impact through the entire system and not onto isolated points which are prone to failure. This, combined with the tough 3mm thick High Density Polyethylene netting material, means that nets can be left in place over the winter, unless they need to be removed for repair work. However, should the nets need to be removed thanks to the cocoon design and tension wire fitting they take just 10 minutes to dismantle and, once fixed, will take just 10 minutes to reinstall. total-play’s confidence in the HD Protection Tunnel netting system’s durability is such that it offers a 5 year warranty on workmanship and faulty materials. As well as being available on all total-play designed ECB non-turf cricket pitch system designs, HD Protection Tunnel can be retrofitted to existing netting frameworks to breathe fresh life into existing cricket practice net facilities. This not only enhances player safety as the ‘cocoon’ prevents balls passing between lanes through gaps that may occur in traditional panel netting but also considerably reduces the amount of end of season maintenance clubs need to carry out on their non-turf practice nets facility.